I've been trying to use eggplant in new ways, and I came across this recipe the other day. I've never thought of using eggplant in a soup before. I made a few modifications to it, and it was excellent. Not only was it tasty, it was very easy to make, too! 2. Cut eggplant in half lengthwise and place on an oven proof tray cut side down. 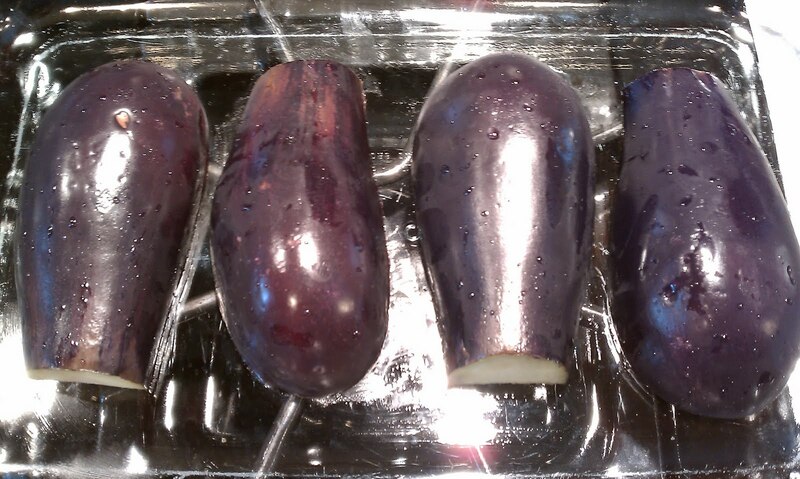 Bake for 30 minutes or until eggplant is very soft. 3. Meanwhile melt butter or heat olive oil in a large saucepan and cook onion, covered for about 15 minutes or until very soft and golden. 4. Add beans and the liquid to the onions and bring to a simmer. Cook for about 10 minutes or until your eggplant is ready. 5. Scrape the flesh from the cooked eggplant and add to the soup. Simmer for a minute or so, then puree to desired smoothness. 6. Taste and season with salt, pepper and lemon juice. Serves 4. I'll be making this - I'm the only one who will eat it - but, it looks so good. I may be able to trick the girls into eating it - we'll see. Liv loves soup and, generally, will always try any soup I make. Nat, even if someone doesn't like eggplant, I think they will love this soup. It might be one of the tastiest soups I've ever made, and it can't be any more simple to make. I think the girls will like it. I could eat an entire pot of this stuff!